On 12 August 1912, Corsican collided with an iceberg near Belle Isle, but escaped with only minor damage. From April 1914, Corsican made four Glasgow-Montréal roundtrips before being taken over as a troopship in August. During her trooping duties she became Canadian Pacific property when the acquisition of the Allan Line was completed on 16 July 1917. 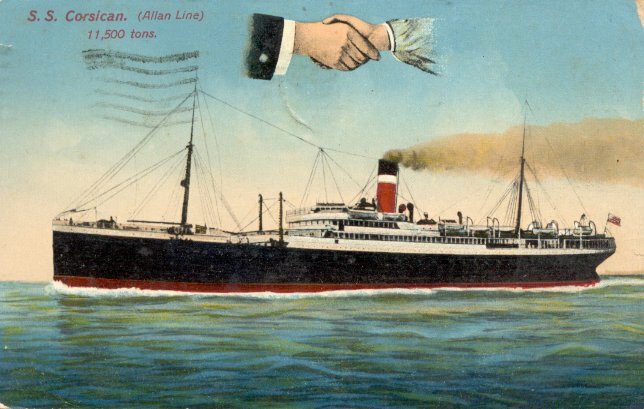 She re-entered commercial service with an August 1918 sailing from London to Montréal and then returned to Liverpool-St. John service in January 1919. Over the next three years, Corsican served Canada from London, Glasgow, Liverpool and Antwerp. A major refitting in 1922 left her with a new passenger accommodation configuration (cabin/third) and a new name (Margrave). Margrave's final voyage, from Glasgow to Montréal by way of Belfast and Québec began on 26 April 1923. On 21 May, on the return leg of that trip, she was wrecked on Freel Rock, 20 miles (32 km) west of Cape Race. Although no lives were lost, the ship was a total loss. Sources: Haws Merchant Fleets; Bonsor's North Atlantic Seaway; Kludas' Great Passenger Ships of the World.